Successfully Added 6 Inch HD Touch Screen GPS Navigator with DVB-T to your Shopping Cart. Introducing the first portable GPS Navigator that comes with DVB-T function: 6 Inch HD Touch Screen GPS Navigator with DVB-T! This means you will be able to access endless hours of high definition entertainment with this easy to use portable navigation device, in your car, in the office, or when hiking or camping. A perfect balance between performance and price. This product comes with all the wonderful functions that a top-notch GPS navigator has to offer and its built in multimedia applications will open you up to a whole new world of entertainment, such as movies, music, games and e-book. It sports DVB-T free over the air digital TV for the best of film, sports, news, and best TV shows. With the FM Transmitter Function, whatever plays on the navigator can be broadcast through your car speakers. On top of that, it has DUAL ZONE FUNCTIONALITY, which allows you to listen to music while the GPS software is running. 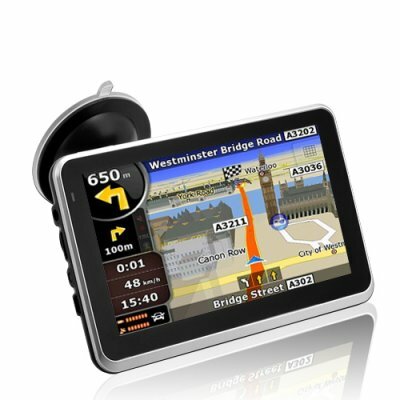 If you are looking for a value for money GPS Navigator, this is definitely the choice! This wide screen GPS navigator supports spoken voice directions, automatic route re-calculation and even the choice of 2D or 3D mapping view that lets you find your way more easily. The wide 6 inch screen format provides you with more actual screen area than a 5 inch screen. This means you will have a better view of the area through which you are driving. The 6 Inch HD Touch Screen GPS with DVB-T sports a sleek, ultra-thin design that will fit comfortably in your pocket or purse, and a car mounting kit makes it convenient for navigation by car. The colorful menu display has a graphical freshness which is not normally available in navigators at such a price. The menu can be easily accessed by your finger or the included stylus thanks to the ultra-sensitive 6 inch touch screen. Order a sample today and we will express ship it out tomorrow! Add it to your online store and enjoy the profits it brings you. Brought to you by the leader in China factory direct electronics - Chinavasion. Loading files into the unit's internal memory is achieved through USB. Before you head out, load it up with all your favorite music, video, and picture files. Listen to your audio files through the built-in speakers. Verry good stuff. The delivery was amazing. I order on monday and they deliver on thusday in Holland.